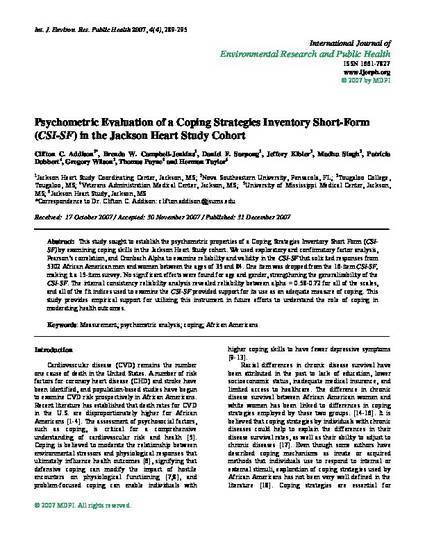 This study sought to establish the psychometric properties of a Coping Strategies Inventory Short Form (CSISF) by examining coping skills in the Jackson Heart Study cohort. We used exploratory and confirmatory factor analysis, Pearson’s correlation, and Cronbach Alpha to examine reliability and validity in the CSI-SF that solicited responses from 5302 African American men and women between the ages of 35 and 84. One item was dropped from the 16-item CSI-SF, making it a 15-item survey. No significant effects were found for age and gender, strengthening the generalizability of the CSI-SF. The internal consistency reliability analysis revealed reliability between alpha = 0.58-0.72 for all of the scales, and all of the fit indices used to examine the CSI-SF provided support for its use as an adequate measure of coping. This study provides empirical support for utilizing this instrument in future efforts to understand the role of coping in moderating health outcomes. This is a copy of an article published in the International Journal of Environmental Research and Public Health. Correction to Article is also attached. Click on additional files link.